Fishing with barbless hooks has its advantages. A barbless hook, due to its smaller diameter, is more likely to penetrate a fish's mouth when the hook is set. Furthermore, barbless hooks are ideal for catch-and-release fishing because they can be removed without injuring the fish. Finally, barbless hooks come in handy when you accidentally hook something, or someone. Select the hook from which you will remove the barb. Make sure that it is undamaged and has not been bent too far out of shape. Grasp the hook shaft firmly between your thumb and forefinger. Make sure that the point and barb of the hook are exposed. Carefully align the pliers over the tip of the barb on the hook. It is important that the pliers be properly aligned over the tip because poorly aligned pliers will slide down the barb and will not effectively flatten the barb. Gently squeeze the pliers to apply pressure and flatten the hook barb. The hook barb should flatten easily to the point where it lies flush against the main portion of the hook point. Examine the hook and determine whether the hook barb has been completely flattened. Repeat Steps 3-4 as necessary to ensure that the barb will not impede the removal of the hook from fish or other objects. Most pliers have grooves etched into their jaws. Try to position the pliers in a manner that offsets these grooves in relation to the point of the barb. 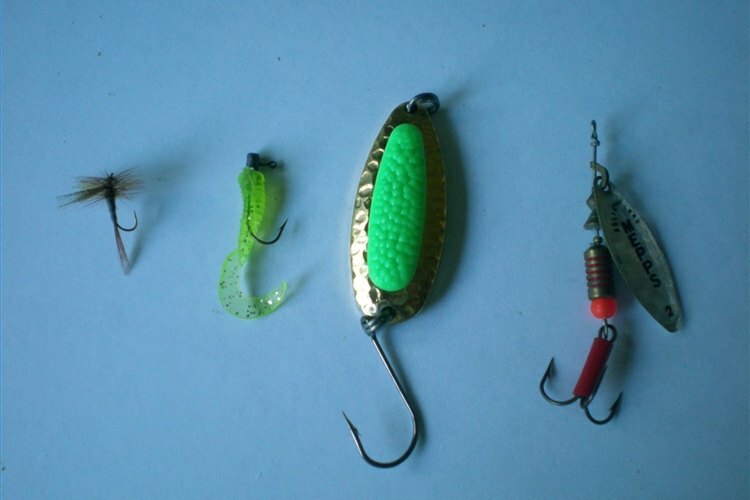 Otherwise, the hook will slip into a groove and the extra space will prevent you from flattening the barb of the hook. Apply pressure gently when crushing the barb of the hook. Excess pressure will frequently break off the entire point of the hook.